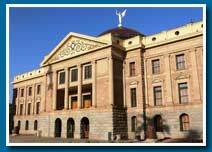 Moms and Pops of America has been recognized by Arizona state legislature as a stakeholder of small business and consumers whose sentiments might not otherwise be voiced during the legislative process. Kara Holt, the President of Active Resort Properties Management Group, is the registered lobbyist for the Moms and Pops of America. Ms. Holt wrote and brought forth the amending language to the Long Term Space Rental Act (1999), Title 19 Chapter Article I ARS 33-2102 and Article III ARS 33-2132.